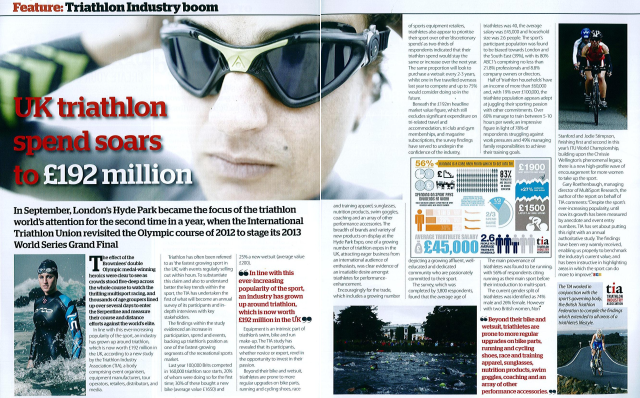 Between Alistair Brownlee’s gold medal-winning exploits in Hyde Park in 2012 and on Copacabana Beach in 2016, the UK triathlon industry grew by 57% to arrive at an industry worth £445 million in 2016, according to the fifth annual research study of Britain’s multisport community by the Triathlon Industry Association (TIA). 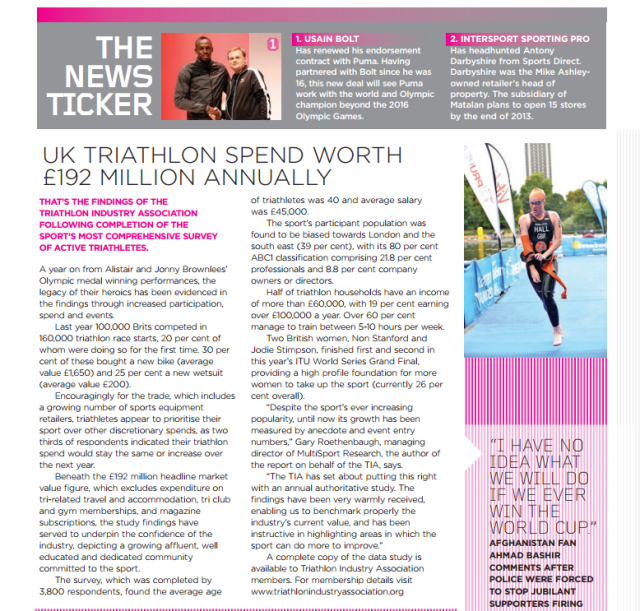 The study, which comprised an in-depth quantitative survey of 5,529 triathletes and multiple trade interviews, found that the UK’s growing population of 150,000 triathletes, up 7% on 2015, are now spending an average of £2,970 per year on the sport. Since London 2012, the areas driving growth included wetsuits (up 137%), sports nutrition (up 82%) and event entries, travel and accommodation (up 67%). Wetsuit sales, benefitting from the growth in the popularity of open water swimming alongside triathlon, increased 13% last year, with 72% of those surveyed having bought a new wetsuit within the past three years. The growing adoption of sports nutrition, up 15% year on year, as a training and race aid was evidenced by 75% of respondents now using nutrition products at least once per week. The economic uncertainty introduced by June’s Brexit vote was unable to stop the industry growing by 4.4% overall on a like-for-like basis in 2016 (Including fundraising, which was measured for the first time in 2016, the market grew by 6.6%). Whilst the ‘big ticket’ purchasing of bikes did suffer, down by 7%, triathletes seemed to console themselves by travelling overseas to race, with 24% racing outside the UK last year. Despite triathlon no longer being the new kid on the block, its grassroots still look in good shape with 37% of those questioned having started their first race in the last three years. Running is still the primary source for new starters, with 56% of new triathletes having previously been runners. New starters are also the primary drivers of the sport’s fundraising efforts. They are almost twice as likely than the average 8% of triathletes, who raise money for charity when they race. But when triathletes fundraise they raise hard, with an average haul of £700 per person for good causes. Reinforcing last year’s social media results, Strava (52%) remains the second favourite social media channel of triathletes, behind Facebook (82%), but last year Strava extended its lead on third placed Twitter (39%). 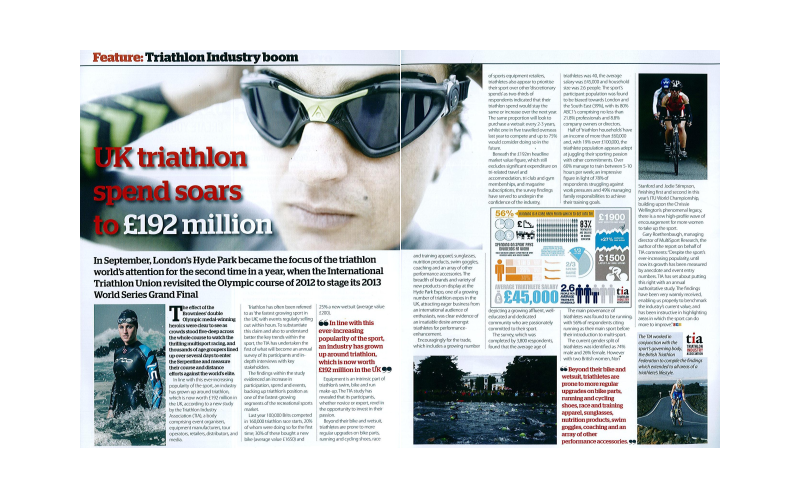 The Triathlon Industry Association (TIA) comprises event organisers, equipment manufacturers, tour operators, retailers, distributors and media. The full 126-page report was produced by independent firm Multisport Research. It is available free to all full members of TIA. Membership costs £450 + VAT per year. All membership enquiries should be directed to Paul Shanley (paul.shanley[at]tri247.com). The sport of triathlon enjoyed a year of significant growth in 2015, with 140,000 people accounting for a record total of 220,000 race starts, and a 15 per cent rise in total spend to £417.5 million, according to the fourth annual research study of Britain’s multisport community by the Triathlon Industry Association (TIA). The annual industry health check, which combined an in-depth quantitative survey of 5,072 triathletes with multiple trade interviews, identified both clear strengths for the industry’s stakeholders to build upon, but also some significant challenges facing the sport. The study pointed to a large, engaged and affluent base of participating athletes, with an average age of 42 and salary of £48,900, spending more on coaching, fitness tech and triathlon-related overseas travel than ever before. The proportion of women doing triathlon stayed the same in 2015 as the year before, at 28%. Interestingly, whilst equally engaged, the female triathlete’s spend bias is towards gym membership, training camps and racing overseas in contrast to the male bias towards new hardware. However, the study also showed that age appears to be a major factor in determining the success of the sport’s recruitment initiatives. The landmark age of 40 years old clearly represents an important milestone, with an 8% rise in participation for the larger group of those over 40 and a 9% drop for the smaller group of those aged under 40 recorded. The research also found that Strava (up to 43% from 35% in 2014) has overtaken Twitter (39% in 2015) as triathletes’ most used social platform after Facebook (73%). This, combined with the relatively low levels of triathlon-related social sharing, less than 25% of active triathletes share content at least weekly, indicates an opportunity to grow the influence of triathlon through social media – and build an outreach to the younger community of Millennials. With a strong British men’s and women’s team soon heading off to Rio to try to build upon the medal-winning feats of the Brownlees at London 2012, the sport will be hoping for more podium places to place the sport firmly in the minds of the younger sporting public. The Triathlon Industry Association comprises event organisers, equipment manufacturers, tour operators, retailers, distributors and media. 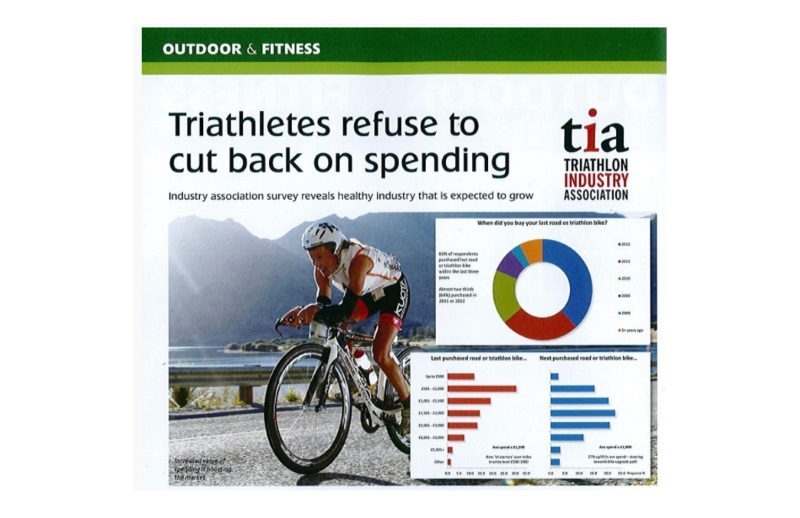 For new membership enquiries and more information about TIA visit: www.triathlonindustryassociation.org. 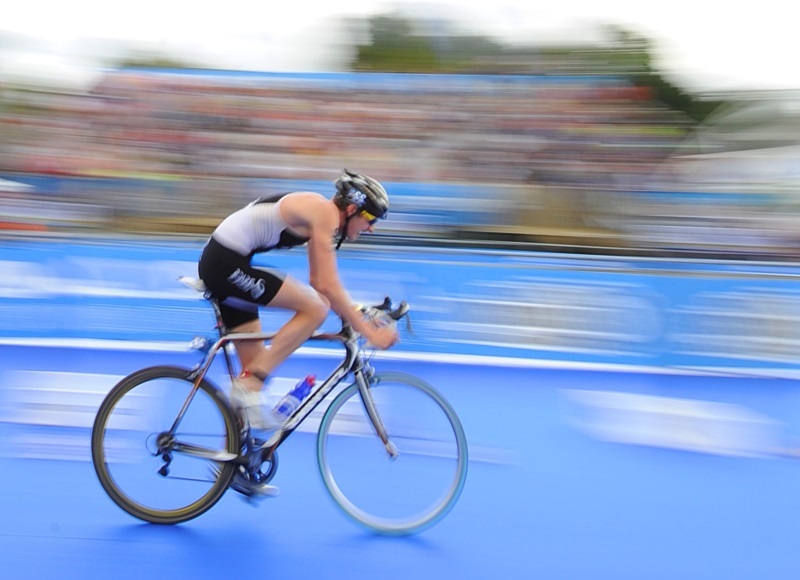 In advance of thousands of Britons swimming, cycling and running this weekend in aid of Sport Relief, the Triathlon Industry Association (TIA) has revealed that Britain’s multisport community experienced double digit growth last year fuelled by the post Olympic glow and the sixth hottest summer since records began. 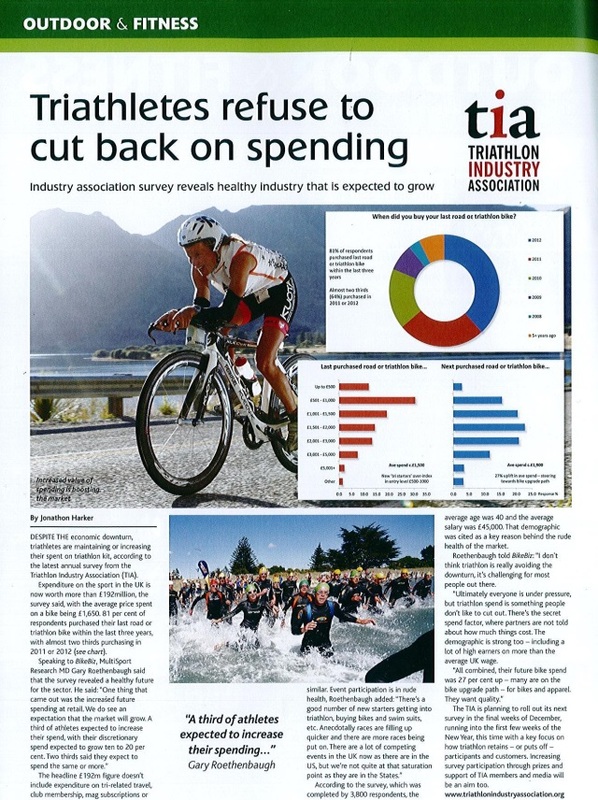 The interim research results of the Triathlon Industry Association’s Annual Triathlete Survey have shown a significant increase in all types of race start – Sprint, Olympic, Middle and Long distance – across 2013 compared with 2012, with the average number of events entered rising to 1.8, compared to 1.6 in 2012. 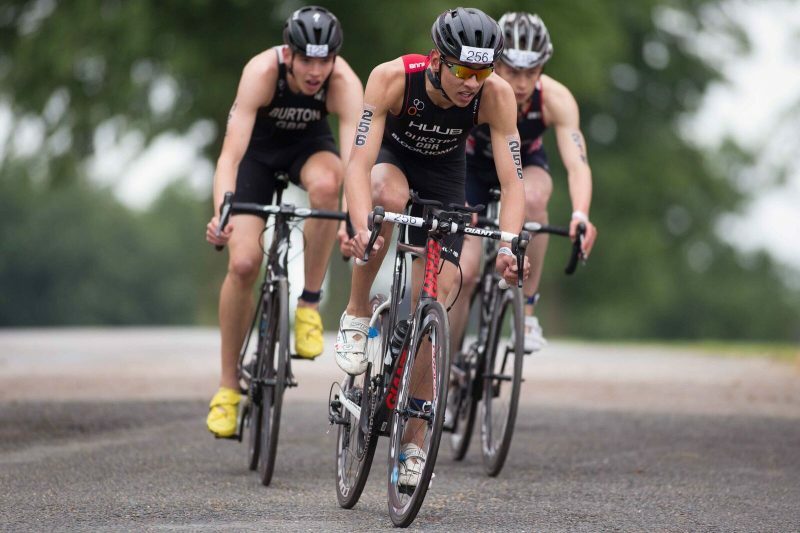 This uplift is reflected by the British Triathlon Federation, the sport’s national governing body’s early indications, which estimate a 16% uplift in 2013 participation to 110,000 active triathletes. 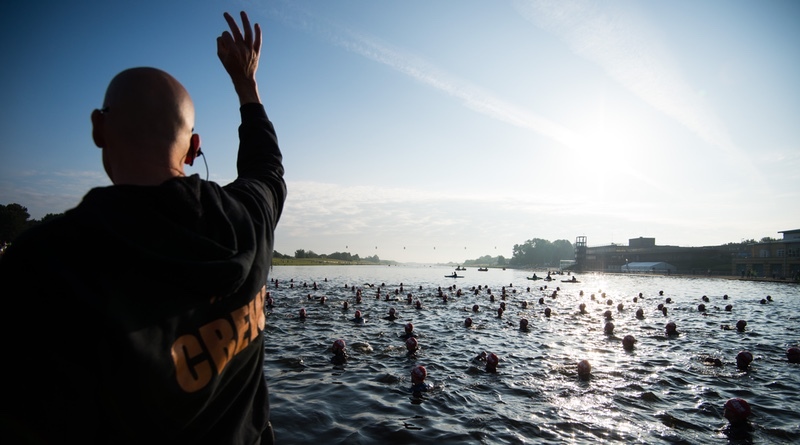 The sport continues to welcome significant new blood, with the study finding that 48% of respondents had started their triathlon journey within the last three years. In terms of athletes’ origins before triathlon, some 56% were runners before they came to the sport, 19% were swimmers and 22% were road cyclists. Triathlon is a lifestyle choice for most, rather than a fad. Almost half of those surveyed (49%) train and race throughout 10-12 months of the year, with 85% training for over five hours per week throughout the winter months. Even those who hadn’t raced a triathlon in 2013 remain committed, with 88% considering a race entry within the next twelve months. As well as a lifestyle, triathlon is a competitive sport and participants are committed to investing in the latest gear to maximise their performance. 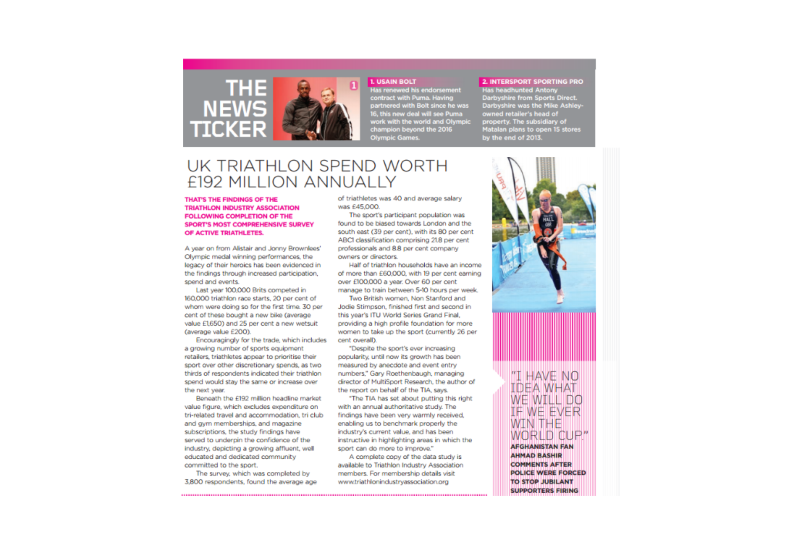 Over two thirds of those questioned expect their discretionary triathlon spend to be the same or increase over the next year, with bikes the most expensive outlay. Respondents had spent an average of £1550 on their latest bike and expected to spend £2000 on their next bike upgrade. The TIA’s Annual Triathlete Survey, first undertaken in 2012, provides the most comprehensive overview of the British triathlon community. Conducted over a two month period, there were 4,100 survey responses to questions on all aspects of a triathlete’s lifestyle. 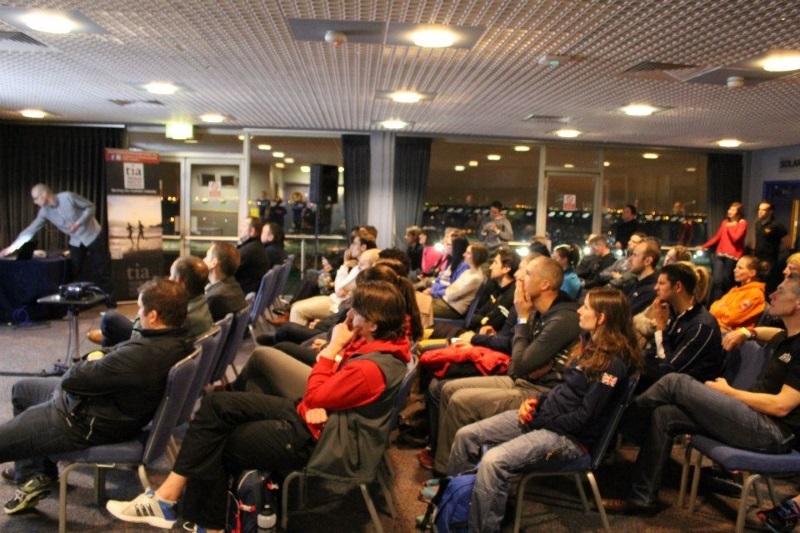 The TIA, which comprises event organisers, equipment manufacturers, tour operators, retailers, distributors and media, has worked in conjunction with the British Triathlon Federation to compile the findings, which extend to all areas of a triathlete’s lifestyle and expenditure. A complete copy of the data study is available to TIA members. For new membership enquiries, visit: www.triathlonindustryassociation.org. We spoke with John Newsom and Bevan James Eyles at leading global triathlon podcast IMTalk about the latest research findings from TIA’s UK Triathlete Survey. The discussion (which started at around 45 mins in episode 353 of the podcast) covered a number of areas. 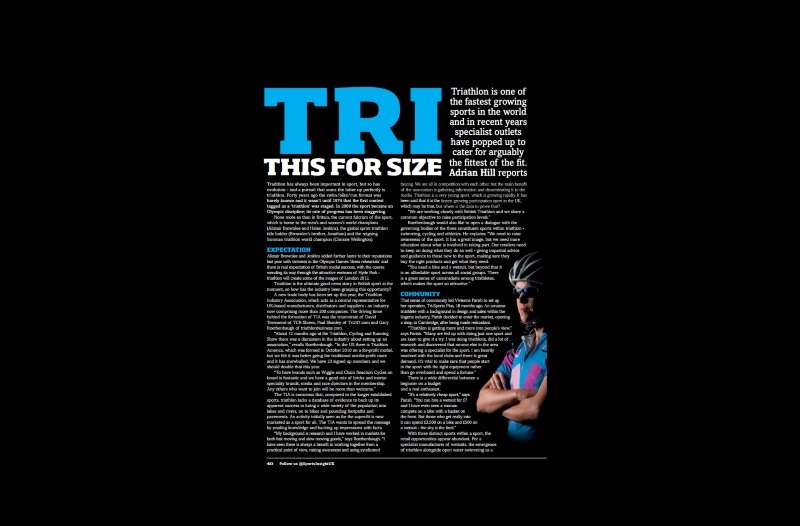 These ranged from the origins of TIA, through to the outline structure of the industry, sponsorship challenges for triathlon, types of triathletes and some summary findings from the survey. 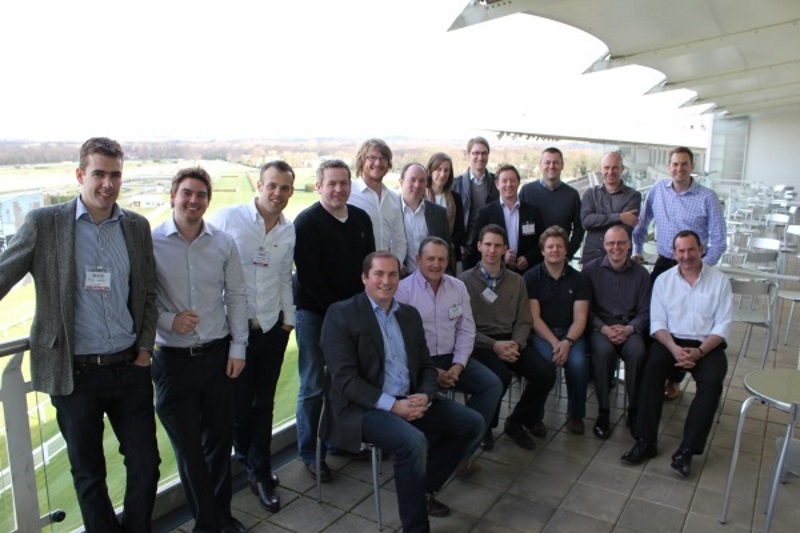 Courtesy of the Triathlon Show and Sandown Park the official Triathlon Industry Association get-together was held at Sandown Park racecourse. After a first meeting, members were treated to lunch and an afternoon at the races.